This issue first presented itself in Windows 8.1 with the 15.7 driver update, it is present in all versions after 15.7. This issue is not present in ANY previous version of CCC, downgrading to 15.6 resolves the issue but this is not a solution. It occurs when the GPU switches from 3D clocks to 2D clocks. Playing games in Borderless Fullscreen trigger the issue a lot due to clocks switching back and forth. Watching hardware accelerated video will also trigger the issue, doing nothing at all will trigger the issue eventually. It does not occur in any version before 15.7, 15.6 being the last functioning revision. Something changed between 15.6 and 15.7 ,causing this aggravating issue. The issue temporarily goes away when the clocks switch to 3D mode, when you reset the graphics driver, when enable/disable GPU Upscaling or VSR. Turning the monitors off and then on also resolves the issue temporarily. Others on Reddit have confirmed that it is indeed the Memory Idle clocks being TOO LOW for multiple monitors in 15.7(15.7.1). This causes extreme display flickering across all monitors when the GPU is in 2D mode. 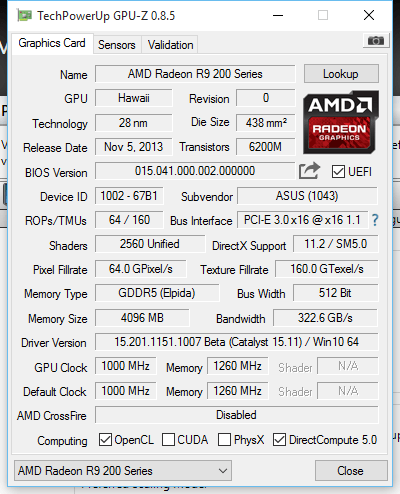 The only fix so far is to manually overclock the 2D memory idle clock in GPU Tweak or Afterburner. I have not tested this yet as I am at work. When you are using your card for a 3D game and running a 2D application at the same time...there can be a conflict. I have a R9 290 and do not have this issue..why? I right click on a flash program and uncheck 'hardware acceleration'..which has been the fix for this for years. Others disable hardware acceleration through their browser ..in IE tools > internet options . advanced. Firefox and chrome have the same feature. It's there for a reason. It's a fresh install of Windows 10, no games have been played yet. The second video where it is only CCC open, nothing else, doesn't corrupt until the window is moved. This also only occurs when using more than 1 monitor. Ok...well it sounds like report time...everybody needs to send a 'Issue report" describing this issue. The more reports the better chance for a fix in the next beta. Remember, don't be expecting personal responses from the Technical dept...what they need to know is if this is happening to anyone else but you. If so, why? Is this problem only happening with Intel processors/Windows xp only/OS/which graphics card, etc. Not running Eyefinity. Switching CrossFireX on or off seems to resolve the issue for anywhere between 30 minutes to a few hours. It seems like certain kinds of video or locking/unlocking Windows triggers the issue, but not every time. I'm really hoping this gets fixed soon. Same issue here, using 3x Dell U3014. I have created a similar thread on the support forums (R9 290 multi monitor image corruption with Catalyst 15.8 beta and 15.7.1 ). Please check and, if possible, reinforce this post with your experience regarding this bug. We need to get AMD's attention to this issue, since 15.8 beta still does not provide a fix for this matter. For those who are trying to roll back to 15.6 (last released driver prior to this bug) under Windows 10, recall that Windows update now automatically update drivers, therefore, after installing 15.6 Windows might reinstall the newest stable version (15.7.1), bringing back the issue. To solve this, try using the Display Driver Uninstaller software (Display Driver Uninstaller Download version 15.4.1.1 ) with the option to block Windows auto driver updates. Alternatively, there are some methods (Google them) to prevent Windows 10 from downloading drivers using only natively built tools. I've worked around the issue by going into the AMD Catalyst Control Center -> My Digital Flat Panel -> Properties. Then I toggle the "Enable virtual super resolution", i.e. if it was on, I turn it off and if it was off I turn it on. This does what looks to be reset of something as the output on my screen goes blank for a second or so and comes back - but the flickering is no longer there. A few hours later it comes back, I pull up the AMD CCC and I toggle the setting again. If you use "virtual super resolution", then just turn it off and turn it back on. I had been running two 1920 x 1080 screens on my single R9-290 and never had this issue. Today I replaced my screens with two 2560 x 1440 screens, now I get this after about 5 minutes. The best thing I have found so far is to leave a high res youtube video running in a minimized window just to force the GPU to clock up. Works instantly. As soon as the video stops, then instant flicker. After playing with this a bit more I have found that simply playing a high res local video in a minimized window stabilizes this issue. The interesting part is that the GPU clock is running 300 - 305 MHz doing this, but the memory clock has gone from 150 to 1250 MHz. using a youtube video to provide a load also ran up the GPU clock. so it appears the real culprit is the memory clock running too slow. I use this workstation for business so I'll probably just replace the video card with a different make. It's too bad because our whole engineering dept is using these cards and we are now changing out the monitors. A fix for this would save a bunch of cards from the trash. Another quick workaround solution is to enable/disable eyefinity display group. After spending an entire day trying to figure out why low load caused this issue. I decided to try re=wiring some stuff. I had one monitor connected to the HDMI port and one to the Display Port. I re-wired it leaving the one in the Display port, but then daisy chaining from the MST output on that monitor over to the second screen. It hasn't flickered since. The driver shows the display port output as 7.42 Gbps and 35% load on each screen. Total load 70%. Total Bandwidth 21.26 Gbps. Maybe it has something to do with using the mixed connection. With my old 1080p screens I had one in HDMI and one in a DVI port and it worked fine. Or, perhaps the HDMI cable just didn't handle the extra bandwidth going from 1080 to 1440. But so long as I kept something running to put load on it there was never a flicker, so I do not think it was a bandwidth issue. At this point it has been stable for 8 hours, so something in that port change made a difference. Has anyone tried driver 15.9 Beta? I was eagerly waiting for this release, but, as our problem is not listed neither under the "Fixed Issues" nor under the "Known Issues" sections of the beta release notes, I am reticent about uninstalling 15.6 (which works fine) to install 15.9. R9 390 - just installed 15.9. No flickering yet. Edit: Problem returned after a few hours. This isn't just DP problem I'm on HDMI and getting daily flickering, especially when watching a youtube video on chrome. Luckily the flickering isn't showing when gaming but when browsing the web and doing other desktop require work, it is unacceptable and this should have been fix long ago but it still persist even with the latest 15.10beta drivers. I'm not experiencing the blackness issue you describe. There seem to be several display corruption issues that sometimes get bandied together in one lump. It seems that the 3XX users have the more complete screen corruption whereas some of us 290x users just have the horizontals line flicker issue that doesn't consume the whole screen, but just a small portion. For me, I have less of an issue using 2xDVI and 1xHDMI vs anything with the DP, but I still get weird flicker issues and I also have issues with the screen on the hdmi cable not waking up properly. The frustrating part remains that none of these issues existed in several driver builds so there is clearly a solution on the driver side. That and the fact that this thread and others continue to wear the "Assumed Answered" label when that is simply not the case. I tried the new beta 15.10 and same issues. Just yesterday I upgraded from 2x 1920x1080 panels to 2560x1440, and instantly noticed underflow corruption issues. I installed MSI afterburner and disabled ULPS and it seems OK so far. It seems like the ULPS might not have done the trick, currently I have applied an overclocked profile to always stay at 1000core/1250mem and it doesn't show any issues. Obviously it comes at a cost, higher core temps and louder fan. On my configuration I noticed the corruption happens when I'm doing easy stuff on the Desktop, the Core clocks are usually around 300 MHz and the Memory is stuck at 150 MHz, the culprit could be the low memory clocks which don't provide enough bandwidth for Extended Desktop @ 2x1440p. I'm still getting both microstutter and flickering on desktop. Can you tell me if you also get microstutter on desktop? Try dragging a window around and see if it skips every few interval. Same issue here with 15.11. I must admit, though, that now it is taking longer for the corruption to begin. On the other hand, performance on games is worse than ever with 15.11. I guess I will have to roll back to 15.6 (again). Once again, I'll send AMD an issue report form, but, sincerely, I have lost all hope. This bug has been around since 15.7 and six driver versions were released so far without AMD even recognizing that the problem exists! I am seriously considering buying NVIDIA's GTX980Ti and selling both my R9 290. * I have read on another thread that using an active MST hub might solve the issue. It is a minor investment compared to a new graphics card. It might be worth trying. I still can't believe why this isn't a known issue. I am switching off monitors at least 10 times a day for like half a year now. This is getting ridiculous. I remember this issue back with 7950 and basically what worked was to create a profile in CCC. Then if I remember the config file is located in Appdata, the config file contained to 2d and 3d clock MHz which I had to increase for two monitors. Hope this helps. Usually i can turn on and off the screens and the problem goes away for some 30 min or so. Screens: Asus MG279q and Pb278. 1440p resolution 60hz. A quick fix, seems to be to disable ULPS. I did this through the latest MSI afterburner, after reading some of the suggestion in this thread. Nevermind the previous post, just a fluke. After a reboot the problem was back. But it goes away when i start folding with my GPU's.... So the previous post from John007 about increasing idle memory speed is probably the correct way to go. So far so good. Havn't seen any corruption yet. No black screens either. Do the computer has been in use for only 2 hours with the new driver. For me it seems improved, i saw tendency to corruption, after i quit a game, but then when i had truly exited, it was completely gone. In my case, after I quit a game, corruption started, as usual. Strangely, during the game there were some brief corruption happening, which I have never faced with previous driver versions. Thank you Dedrick. This has been plaguing my setup (2X R9 290X in Crossfire) for a long time. I downloaded the OBS Multiplatform and previewed an image as you so handedly instructed and my flickering seems to have stopped, so thanks again! I wish AMD would recognize this problem because it is very frustrating! Without starting a new thread, I want to explain something I did in the past. Like probably many of you I run 3 monitors in eyefinity and one 1080p TV on top via the HDMI port. In the past to get this to work I would have to run only my eyefinity without the TV on, then wait for the flickering issue to start. Once started I would turn on my TV and the 4th screen would kick in and effectively stop the flickering. I didn't have a choice when to turn it on but usually after 30 minutes or so the flickering would start and I would turn on the TV to fix it. If I turned the TV on before the flickering I would get the sound of a display being recognized then not over and over and none of the screens would work. Sometimes I could catch the eyefinty setup in CCC fast enough when 3 monitors appeared to engage it but it was difficult and frustrating not that the whole process isn't already. Well today I installed Radeon Crimson and attempted to turn on 4th screen but instead the system tried to make a 4 monitor eyefinity setup. Being that each one of my monitors are 2048X1152 it made a mess of it. I had to unplug my TV as well as my Display Port adapter to get my screens working again. The streamlined interface doesn't seem to include arrange monitors (I couldn't find it) so I cannot use the 4th monitor. This process has always been a challenge but I don't think Crimson helped at all. The agonizing thing is, once I went through the process with the old software it would end up working but I was so hoping Crimson would signal the end of this baloney. Anyway I never posted this before but I felt I at least better get this information out there as some people may not have a 4th monitor and that might have something to do with all of this. I do believe the whole display port adapter plays a big role in my issues too. Once again thanks Dedrick and I guess I will be running only 3 monitors and the Open Broadcast Software in preview mode until a fix comes... if ever. I am also having a similar problem on my right hand screen, using the latest crimson driver on my saphire fury triX.... I had it on the previous Beta too. Only seems to happen when clocks are low, i thought changing the refresh rate to 59hz had solved the issue, but it has now come back. I am connecting all three screens with display port cables, and i have a TV connected via HDMI, which is turned off and disabled 99% of the time. I recently picked up another DVI cable and used it in place of the DP cable that came with my monitor. I am only using DVI for both monitors at this point, I haven't suffered from any corruption since I made the change. This leads me to believe it is an issue with either the DisplayPort cable or how the drivers interact with DisplayPort on the card. I have had link failures in the past on different driver versions with this cable but never thought anything of it until I saw a PSA post on Reddit saying that the cheap DP cables that come with monitors can cause link failures and display corruption. I am experiencing the exact same issue with a new Asus R9-380 Graphics card. I am running two Dell U2713HM monitors (2560x1440) using a DVI-D cable to one and a DisplayPort cable to the second. I was initially using a "non-standard" DisplayPort cable - but this caused a different problem. The non-standard DP cables supply power back to the graphics card, from the Monitor. See Displayport cables must not use pin 20 (warning) - [H]ard|Forum for more info. This caused all sorts of strangeness, such as USB3 ports disappearing from Device Manger etc... Luckily no permanent damage. I have ordered a second DVI-D cable so will check whether this also sorts out the flickering problem. The latest Crimson drivers don't fix the problem, but it seems to take longer for the flickering to re-occur. I have changed both display cables to dual-link DVI-D and can now confirm that the Flickering problem has disappeared!!!! The flickering reappears if I connect any one of the monitors with a Displayport cable. Good to hear, I haven't picked up an VESA DP cable yet but it is nice to confirm that dual DVI works for others. This seems to be the most comprehensive most I've found on this issue, which is frustratingly marked as "Assumed Answered"
I'm mostly replying to keep it alive, but also to confirm some of what's in the original post. I had no problems at all when I was using two 1920x1080 screens with HDMI and DVI. It was when I bought two new 1440p and started using the DisplayPort connector that this problem presented itself. I did not have these monitors back in the 15.6 driver days, so I can't confirm that piece, but it does appear to directly be tied to the clock speed of the graphics card in 2D mode. I can work around the issue by using Asus GPU Tweak to run my graphics card at 3D clock speeds in 2D mode, although I'm not a fan of this solution for many reasons. I have to wonder if that's the reason AMD has been so reluctant to fix this problem. Maybe they're scared of releasing a patch that increases 2D clock speeds and they're waiting as long as possible to minimize the possibility of warranty returns should the fix cause problems. I know that seems overly paranoid, but I can't think of any other reason why this issue would be so ignored despite the clear and widespread reporting. I guess the best we can do in the meantime is continue to keep the discussion alive and make sure everybody experiencing the problem files a bug report. I have a new Asus R9-380 card and was suffering the same flickering problem. As mentioned in a previous post, I was able to solve it by connecting both of my 1440p monitors using DVI-D cables. No need to increase the 2D Clock speed. The problem returns if any one of the monitors is connected using a Displayport cable (even with a VESA approved cable). This gives me some hope that this issue can be solved without compromising the low-power performance in 2D mode. Quite the Mickey Mouse sollution but it works. brand new r9 380 4gb getting RMAd today for this very reason. Don't care if hardware or software is at fault - this product is not fit for purpose, it says I can connect my 3 monitors but obviously I can't. We did it boys? I can't confirm if this has anything to do with this issue as I no longer have my DisplayPort Cable. Unfortunately 16.1.1 does NOT fix this issue. Thankfully setting "Alternate DVI Operational Mode" Off and "Reduce DVI Frequency on high-resolution displays" On for the DVI connected monitor(s) seems to still work as a "fix" for the problem until it can be solved properly. Same problem here for the last few drivers. Sapphire 290x Tri-X card with 16.6.1, have to switch something like VSR for it to work properly for some time. Getting pretty sick of this and I don't get the feeling that AMD gives a damn. I have three monitors connected. 1440P through DP, 1080P through HDMI, 720P through DVI. I am also getting these spazzing horizontal/vertical lines with my MSI twin Frozer r9 290. I have a 850 Watt power supply so that is no a issue. Again this only comes up if there is more than one monitor active. Although I did notice that if you enable both monitors and then reboot they will function correctly. If you boot up with only one monitor active and then enable the second all hell will break loose again. I have the opposite experience; booting with 2 displays causes issues, but if I boot with 1 and connect the other in Windows, I don't get any flickering issues. Well I should clarify on my setup. My main monitor is running at 2560X1440 (16:9) and my second is 1440x900. If I boot up with my main monitor only connected to display port (I have tried using HDMI and DVI for the main one) I have no issues but as soon as I turn on the second one via windows it starts spazzing out. I tried running both off of DVI only as well and the same issue persists. So its either a physical hardware issue (Almost like the crappy 7970's I had back in the day) Or like many have been saying the low memory clock when sitting on the desktop or web page. The lines get worse the more I move things around such as a window or something. Running a youtube video at 4k also does nothing to help unlike some people have stated. Is there really no way to change and permanently set the lower memory clock? I have had this issue on my single monitor setup. I have tried installing the update on my pc, but to no avail. The only version I could find that does not cause the issue on my pc is version 16.11.4. Anything after causes the issue with my sapphire r9 390. July 2017 and I also have this same problem when using DisplayPort. Crimson ReLive 17.7.1 or w/e the latest driver is at the date of this post. I've owned the Tri-X 290 for 2 years and only now am experiencing this issue since using DP. I'm currently using a Dual Link DVI cable to get 120 hz at 1080p with absolutely no issue. HDMI no issue. I bought a monitor to use 144hz FreeSync and so far it's been a failure. Horizontal lines, flicker, blackscreens. Its even causing my monitor to make loud 'POP' sounds when corrupting. It is complicated by the fact that changing DP cables can make it better or worse. Interesting to note that the "crap" cable that came with my 144hz monitor works better than the 3ft DisplayPort certified cable by miles. Of course, downclocking the monitor to 100hz or 60hz helps, but doesn't fix the problem. Changing clock speeds in memory using AfterBurner or WattMan seem to clear up the issue until launching certain games or enough time passes. Increasing voltage doesn't seem to matter. I'll post logs from GPU-Z and AfterBurner, etc when I'm home. How can I monitor 3d vs 2d clocks or driver output?